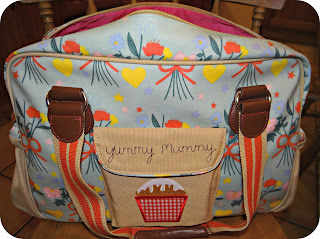 When I was pregnant one of the most exciting buys for me, cot and pushchair aside...was my changing bag. I wanted something that I would not be ashamed to take out and about with me, something that was unique and something that did not look like your everyday changing bag. There are so many different options out there, in different colours and styles but only one very special brand has the most vibrant pink, water resistant lining. The Pink Lining changing bags have always turned my head when I have seen them going past me in the street, draped provocatively over someone else's pushchair prompting that little green eyed monster to rear his ugly head. I dropped a number of hints to Luke in the hope that he may make one appear, but my not so tactile hints of leaving the computer screen open on the coveted Yummy Mummy bag did not work. 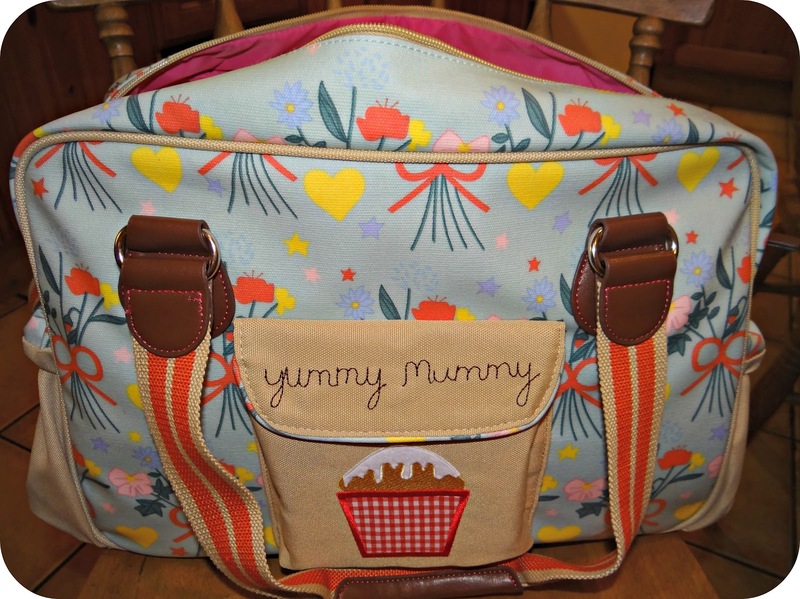 Pink Lining must have got wind of my passion for their bags, as they kindly sent me their new Yummy Mummy Blue Bouquet bag from their just released Autumn Winter range. 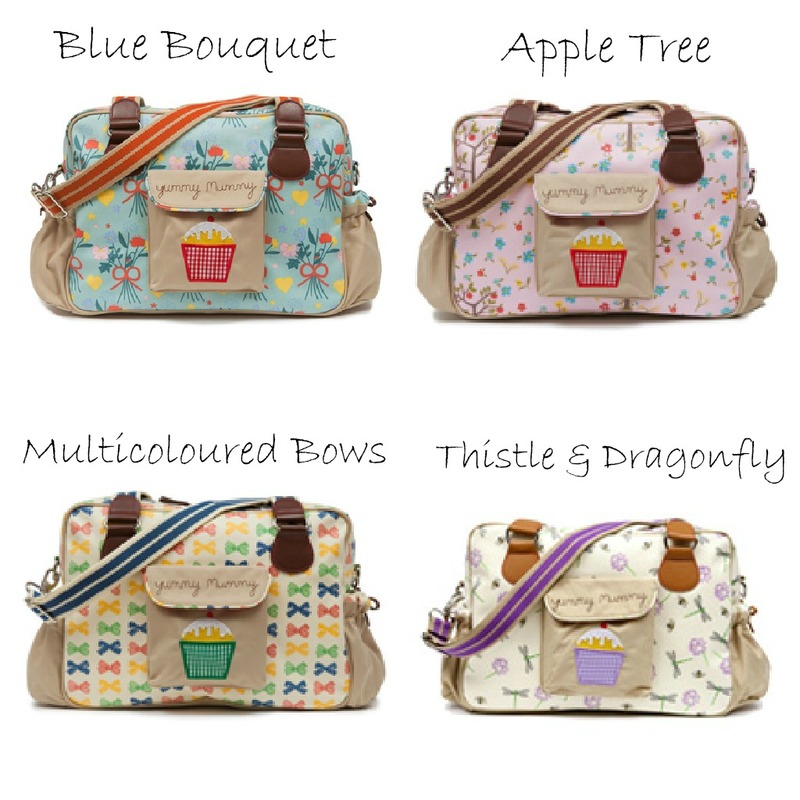 The Yummy Mummy changing bag is Pink Lining's most popular bag, and it comes in Four unique designs. The bag arrived really well packaged, in a official Pink Lining box giving a clue as to what treasures were to be found as I delved inside. Inside the box I was greeted with the trademark Pink. The bag had been wrapped up in vibrant Pink paper which I thought was a lovely touch. With all the paper removed it looked like Christmas had come early, and I was now face to face with my new changing bag. I knew I would already love the design, there was never any doubt about this. It is sky Blue with colourful flower bouquets, tied with a Red ribbon. 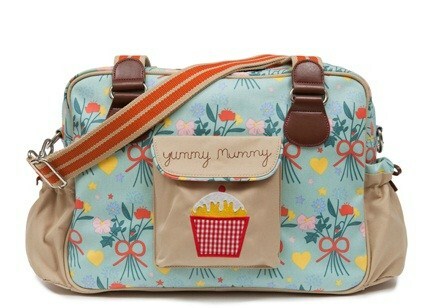 On the front you have the Yummy Mummy slogan and famous cupcake on the front pocket. Pink stars and Yellow hearts accompany the lovely colour's and make this a great bag for those winter's day's when we all just need a little bit of colour in our lives. Aside from the beautiful design of the bag, I was instantly impressed by the bag's size. It is bigger than I first thought it would be, but not too big. It offers you a means to get everything you need inside while still being practical. In those early days when you cannot leave the house without the kitchen sink, you will be very thankful for all the room that comes with this bag. The outer Fabric on the bag is a cotton canvas which is then coated in PEVA laminate which enables you to just wipe clean with a damp cloth. You would never guess that it was laminate just by looking at it, and I have to admit this is a feature I did not know about. From all the Pink Lining bag's I have seen whisk past me in the street, and that I have sat staring at online, I had just automatically assumed that it was an entirely canvas material used on the bag. I could have jumped for joy when I realised that I could just wipe this bag clean, and keep it looking pretty. My old bag is now stained and has certainly seen better days after boasting just a material finish. The vibrant pink lining inside the bag is water resistant and absolutely perfect for carrying around sippy cups and bottles of milk. Leo's drinks are always leaking and the fact I have just been able to grab a towel and dry it out has made getting in and out in a hurry so much easier. When it comes to babies you are bound to have spillages being as prepared as possible is defiantly the way forward. 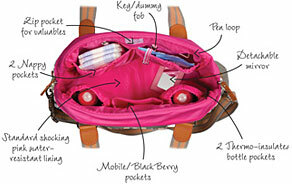 Inside the bag are a number of different pockets for all of the many things that you need as a parent. There are 2 insulated bottle holders, which are absolutely fabulous. I still tend to take a bottle of milk out and about with me as sometimes Leo may just need a rare bottle of milk before he has a nap, and I just like to be prepared. The bottle insulators allow me to keep the milk cooler for longer and just keep the bottles out of the way so that they don't free fall around the bag. My old changing bag featured a separate milk insulator that I was forever losing. I much prefer having everything together and on hand for exactly when I need it. There are two long nappy pockets which allow me to put Leo's nappy's in standing up right. It keeps them neat and together and they don't come out looking battered and bruised as they usually do when you have squeezed them into a pocket. Have you ever put your car keys in your changing bag, and then come back 5 minutes later and you cannot find them for love nor money? I know I have. So this next feature really put a smile on my face. There is a key fob on stretchy elastic, enabling you to always know where your key is. If I had a £1 for everytime I have lost my key in my changing bag on past occasions I would be a millionaire, hopefully this will now be a thing of the past...As I really don't have an excuse any more! Now for anyone who has ever ooo'd and arrh'd over a Pink Lining bag, you will be very familiar with the padded cupcake changing mat and wet bag. The changing mat follows suit in being wipe clean and water resistant, which is exactly what you need from a changing mat. It is a great size as Leo fits comfortably on it (legs permitted of course) and if he does dirty the mat it is so easy to clean there on the spot with a baby wipe. My old changing mat had to be machine washed if it got dirty, and this was not always practical and meant I had to bring it home with me dirty. Of course if your little one is anything like Leo then you may still find yourself dealing with mucky pups. Leo is always dirtying clothes, and he is always dirtying my clothes. Having a wet bag with a zip is something that I would classify as essential. Somewhere to lock away those dirty clothes from the rest of the bag and the spare change of clothes that you always have to take out with you for such emergencies! 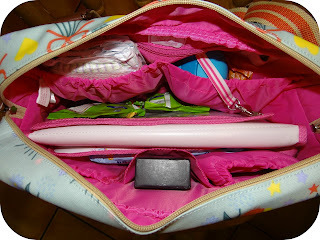 For everything that I have to carry around with me on a day to day basis, the Yummy Mummy Pink Lining bag keeps everything exactly where you put it and above all else organised. Organisation is exactly what you need when everything else about having a baby is so un-organised...Or is that just me!? 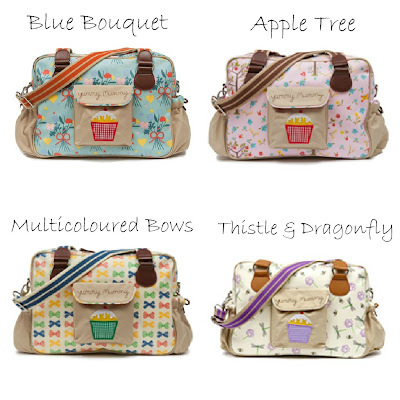 In all my time of admiring Pink Lining from a far, there were features of the changing bag that I did not know about. I based my initial views on a Pink Lining bag completely on the look of the bag, and never even considered the practicality value which has really stepped the Pink Lining range up even higher in my books. I can fit absolutely everything in this bag. Leo's juice, milk, snacks, spare change of clothes and I can even fit in everything that I will then need for me throughout the day. Stepping out with my Yummy Mummy changing bag not only puts a big smile on my face but it also reassures me that I have absolutely everything that I could possibly need throughout the day, and that I know exactly where everything is. They say that beauty is only skin deep but Pink Lining changes all of that. 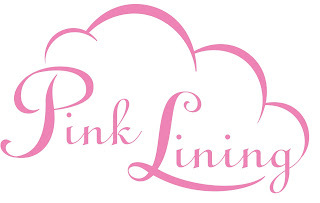 I would highly recommend Pink Lining to Mummy's to be, new Mummy's and Mummy's! Not only is this bag stunning but it has everything that you could possibly need in a changing bag, and I love that they have taken everything into consideration. When I was pregnant I gave my changing bag so much thought and that is because it is something that I was going to be using for the foreseeable future, so if you are looking for the perfect treat for yourself, or are very good at dropping hints to your better half....Think Pink Lining. 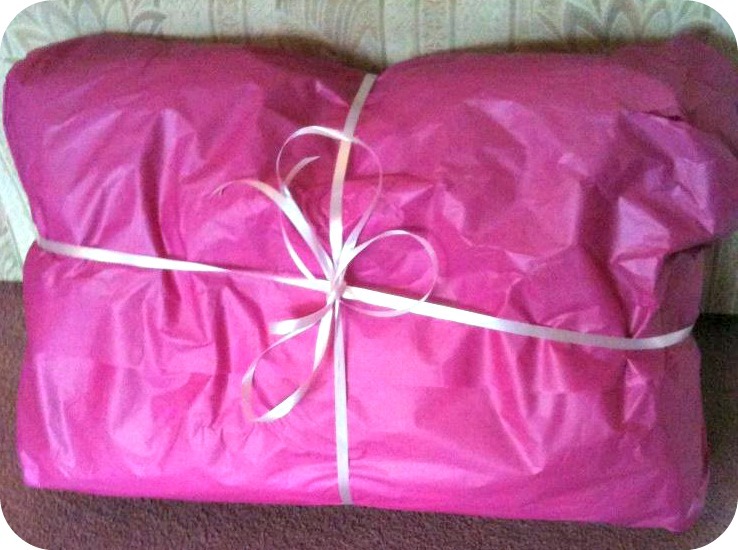 The Pink Lining Yummy Mummy bag retails at £79.00 and you can purchase your's here. If you wanted to read more you can read another review by fellow blogger U Me And The Kids for the Mama et Bebe Changing Bag. 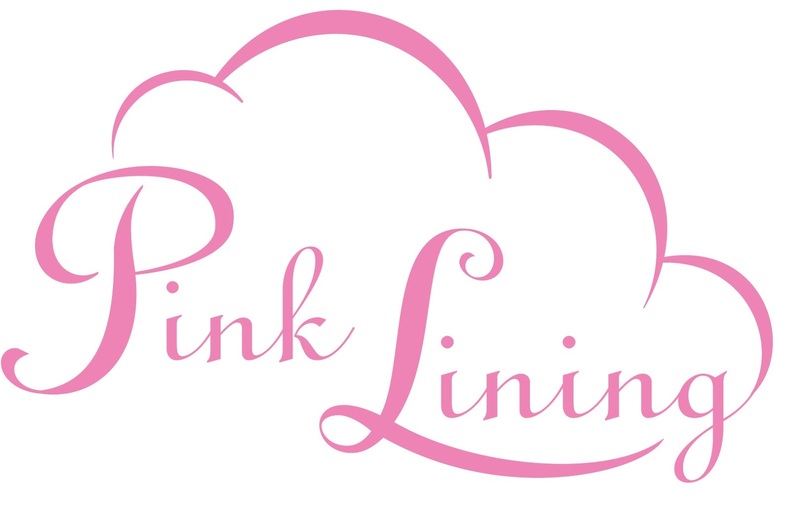 Disclaimer: I was sent the Pink Lining Yummy Mummy bag for the purpose of this review, however all views and opinions are completely honest and my own.